If you’re not familiar with Nokia OZO, that’s the strange little guy in NokiaMob’s logo. OZO is a VR camera developed by Nokia Technologies, and was first of its kind packing 8 cameras with 2K resolution into a portable and attractive body (inspired by human skull). Nokia Technologies unfortunately shut down the OZO hardware business in late 2017. Last week our American readers (and everyone that follows American Football) enjoyed watching the Super Bowl. 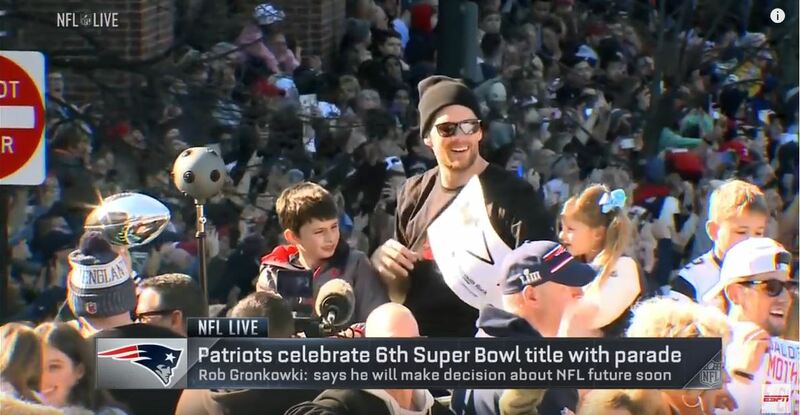 New England Patriots won the Super Bowl again and had a, what is now turning to be regular, homecoming parade. I personally am not interested in Super Bowl, but I was excited expecting SpongeBob’s Sweet Victory performance at the halftime, but it was unfortunately a disappointment, but that’s not the topic of this site 😉. During the homecoming parade coverage, our reader Micheal (thanks for the tip ;)), spotted the OZO camera on the bus with the champions. OZO still looks extremely attractive and futuristic, and New England Patriots have been using OZO for a few years now. The news coverage from ESPN where you can see OZO and a VR video from the parade follow down below. In 2017, when OZO hardware business still seemed like something with a perspective future, the device was introduced to the general public in the United States via a Super Bowl ad. The ad was not from Nokia, but from Hyundai that used OZO to connect American soldiers deployed overseas with their families. The emotional ad follows down below. Nokia OZO is such a nice piece of industrial design and it was designed, developed and manufactured in Finland. That also explains the initial price of 50,000 euros, which later fell on 20,000 euros. After OZO, Nokia Technologies also shut down the Digital Health Business by selling it back to Withings co-founder, and now is mostly (if not exclusively) focused on licensing.